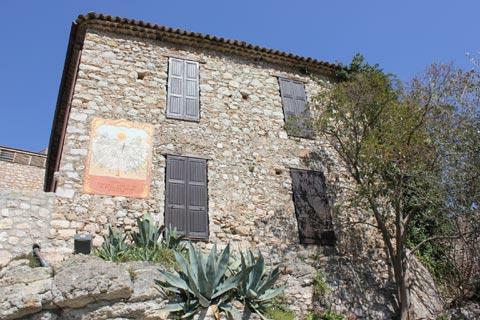 Gorbio is a village perched on the side of a hill just a few kilometres inland from Menton, on the Cote d'Azur and in the south-eastern corner of Provence. You are also very close to the border with Italy when in Gorbio. As with the other 'perched villages' in this region of Provence it is the stunning location of Gorbio that is a large part of the attraction. 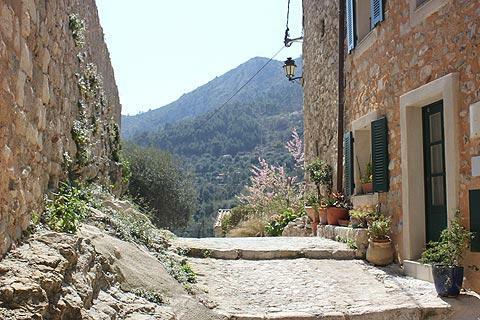 The village is high up in the Gorbio Valley, with steep sloped valleys covered with trees and olives rising steeply all around the village. 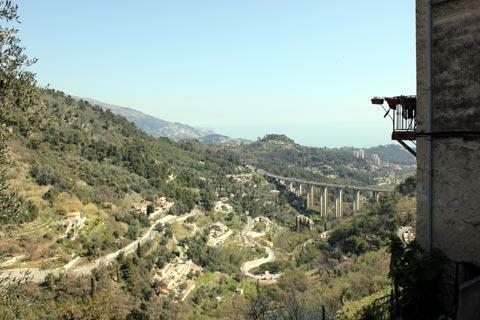 The views from around the village are, not surprisingly, very attractive and as well as the valley itself you can see out across the Mediterranean. 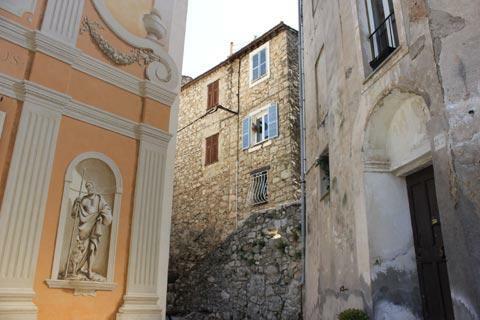 Start your visit in the main square in Gorbio. Here you can see an unusual feature the town is especially proud of - a splendid elm tree with an enormous trunk said to be 300 years old and now officially listed as one of the 'most remarkable trees in France' (who keeps a list like that I wonder). Also in the main square is the 19th century Malaussene fountain, once an important source of water for the village. 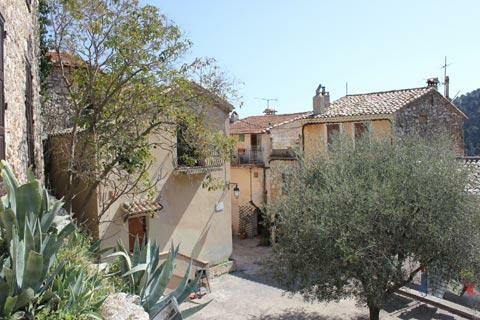 The medieval village follows a loop to the east of the square, passing by the Place de la Mairie (with the Town Hall and a little fountain), the church and Place de l'eglise, then round through the Place Honoré Vial and back along Rue Gambetta. The cobbled narrow streets and ancient houses (mostly built in the 14th - 16th centuries) winding through Gorbio make it a very pleasant place to explore, with some lovely covered passageways and tiny open squares to discover en-route. 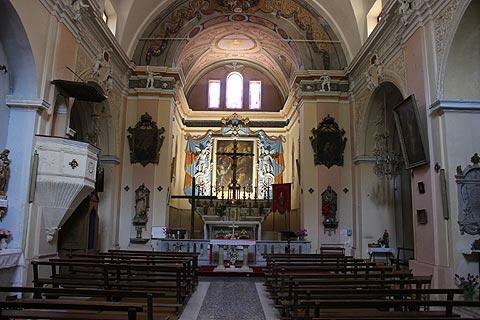 Other monuments in Gorbio include the 17th century Church of Saint-Barthélemy (with a baroque style painted facade and a colourful patterned roof on the clocktower), the 15th century Chapel of of the Penitents-Blancs and the 12th century Chapel of Saint-Lazare. On the edge of the village the large building overlooking the valley is the Chateau of the Comtes de Malaussene, an unimposing 17th century castle. In the tower called Tour Lascaris, all that remains from the more substantial Chateau des Lascaris that stood here from the 12th century, there is a small museum dedicated to native American-Indian art, the Raza-Montgillat collection. France This Way comment: despite its proximity to the busy French riviera, Gorbio is not overrun with tourists and has limited village facilities. Gorbio is a starting point for several hikes in the area, with the hikes to Sainte-Agnes along the GR51 and via the Col du Bausson, and the hike to the Cime du Baudon via the Col de Madone among the most popular. Each of these hikes takes around four hours for the return journey. 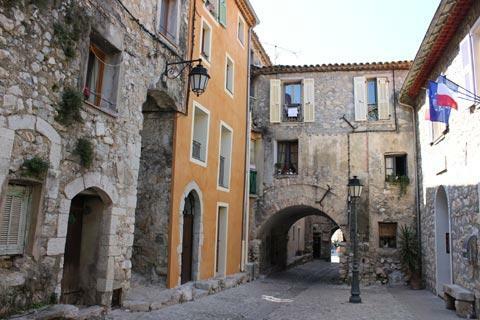 When visiting Gorbio we suggest you plan a route that also includes the picturesque villages of Peillon, Peille, Castellar and Sainte-Agnes (a listed 'most beautiful village of France'). 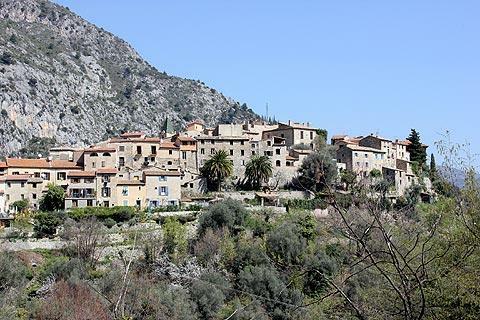 These villages, and the route that connects them, gives a very attractive introduction to the scenery and hill villages of the southern Alpes-Maritimes department, and a quiet day away from the busy Riviera coastline.